"Big Trip 2007" covered parts of Utah, Wyoming, Idaho, Montana, Washington and Oregon over two weeks in late August and early September, and we kick off our recap with several installments in which we explore the towers and studios and history of Salt Lake City and the Wasatch Front. This is a market with much to recommend it to the intrepid tower hunter: as the only large market for several hundred miles, the region is home to a remarkable number of radio stations - more than two dozen AMs and a whopping 48 FMs serve this fast-growing area, which now sprawls for more than 60 miles almost without interruption from Provo in the south up to Ogden in the north. In this week's portion of our Salt Lake recap, we'll show you those outlying signals from Provo and Ogden, then return to Salt Lake City proper to see some of the TV and radio studio buildings in the valley. We start this installment 40 miles south of downtown Salt Lake City, where the southern edge of the city of Provo begins to fade away into the desert of central Utah. That's where we find KOVO (960 Provo), the city's oldest radio station. When we stopped by in the summer of 2007, KOVO was simulcasting the "Zone" sports format of sister station KZNS (1280 Salt Lake City), but changes were afoot. 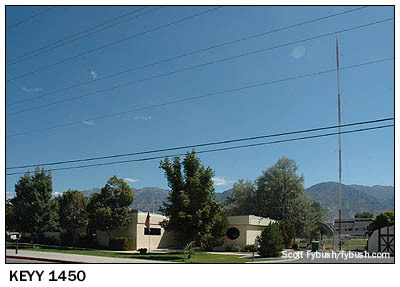 Owner Simmons Media Group has a CP to move KOVO's city of license to Bluffdale, Utah, relocating the station from the south side of Provo to the new KLLB (1510) site proposed for the southwest side of Salt Lake City, and increasing day power from 5 kW to 50 kW. (Night power would go from 1 kW to 940 watts.) KOVO's format also changed at the start of 2008; it's now being LMA'd to a Spanish-lanugage programmer who's doing regional Mexican on the signal. Two non-directional sites round out our little tour of Provo AMs: KEYY (1450) does religion from studios off I-15 just west of downtown Provo, while KSRR (1400) does soft AC from a site about a mile north. Heading back up I-15 toward Salt Lake City, we turn west at the town of Lehi to head to one of the more remote AM sites in the market. 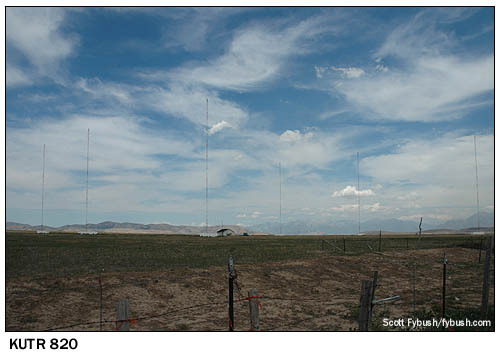 The six towers of KUTR (820 Taylorsville) went up near Cedar Fort, Utah, just west of Utah Lake, in 2004. 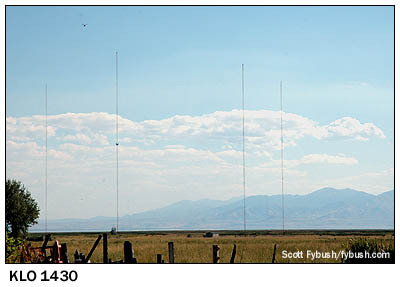 While this is a huge daytime AM signal, with 50 kW nondirectional by day, switching to 50 kW into two towers during critical hours, AM 820 runs just 2500 watts into all six towers at night, sending a narrow lobe north over Salt Lake City and Ogden at the expense of Provo. Bonneville has struggled to find a workable format for KUTR; it signed on with a talk format aimed at women, which gave way after a couple of years to an automated "Soft Sunday Sounds" format, the same mix of inspirational songs and soft AC that sister station KSFI (100.3) carries on Sundays. Since our visit, Bonneville has reached a deal to sell KUTR to a Catholic group. 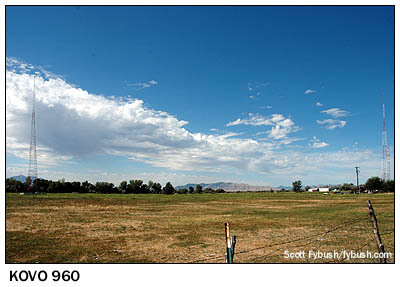 From Provo, we next turn to the other end of the sprawling Salt Lake metropolis - 40 miles north of downtown Salt Lake City, we find ourselves at the north end of Ogden, where a mile or so west of I-15, near Plain City, we find expanded-band KXOL (1660 Brigham City). 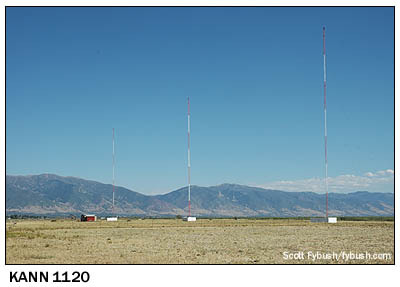 This is the expanded-band offshoot of a now-defunct station, KSOS (800 Brigham City), which operated from a now-demolished site another 15 miles or so to the north. For a time, KXOL was programming 50s and 60s oldies and drawing an appreciative nighttime following all over the west; today, it's yet another Spanish-language outlet. 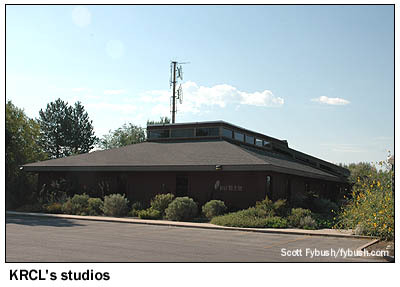 There were once a bunch of studios in downtown Ogden, too, but no longer; instead, we head into the suburban sprawl south of Ogden, near Weber College, to see the nondescript office building that houses KLO (1430 Ogden), one of the state's oldest stations, and its FM sister, KBZN (97.9). Moving west again, past the I-84/I-15 junction and out to the town of Roy, we find KSVN (730 Ogden), one of the first Salt Lake-area signals to go Spanish. A few miles to the south, near the shore of the Great Salt Lake in the Syracuse area, two more AMs sit in close proximity. 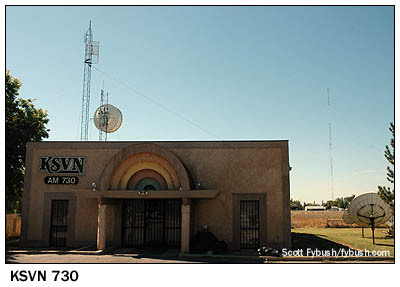 KANN (1120 Roy) is religious, part of the SOS Network based in Las Vegas at KSOS (90.5). KANN began its life licensed to Ogden, as a 1 kW daytimer on 1090, but the breakdown of the clear channels in the eighties gave it the opportunity to move to its present 10 kW day/1 kW night facilities out at this rural three-tower site. It's just a mile or so west of the four-tower site of KLO, which runs 10 kW days (with a CP to go to 25 kW) and 5 kW at night. 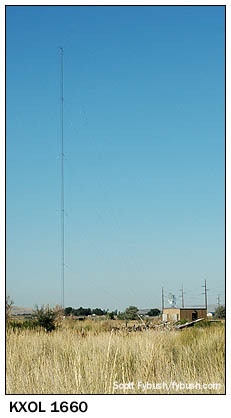 26 stories and 423 feet above KUTV, up on the tallest rooftop in Utah, we find the two-bay antenna of KCPW (88.3 Salt Lake City), the public radio station tied in with KPCW up in the mountains in Park City, which we'll see in next week's installment. Heading west of downtown, we find a cluster of studios near the Salt Lake airport. East of the airport, and just across the street from the hotel where we're staying for the International Radio Club of America's convention, community radio KRCL (90.9 Salt Lake City) occupies a newish office building near the junction of I-80 and I-215. 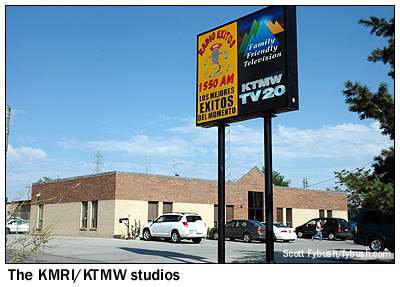 Just to the south of I-80, Spanish-language KMRI (1550) and religious KTMW-TV (Channel 20) share a small building on Redwood Road. 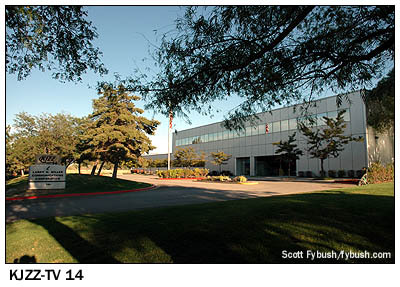 Three more TV stations have studios within a few blocks of each other in the office park just west of the airport. KPNZ (Channel 24) used to be the UPN affiliate for the market, then went independent; it's since been purchased by California's Liberman Broadcasting and is now a Spanish-language indie. 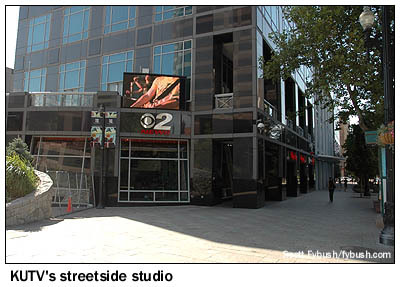 Around the corner on Amelia Earhart Drive, two more TV stations face each other almost from across the street. 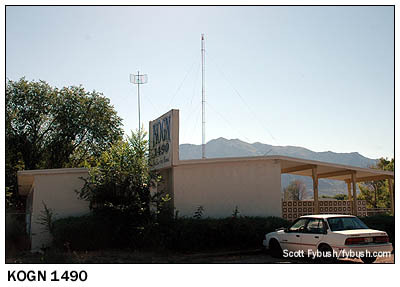 In 1987, KSTU (by then owned by Adams Communications) was purchased by the holders of the construction permit for a new VHF drop-in, KTMW-TV 13. Channel 13 thus signed on not as KTMW but as KSTU, complete with the Fox affiliation that had just appeared on channel 20; the later KTMW on channel 20 didn't appear until 1997 and is unrelated to the original KTMW-TV 13 CP, as best we can tell. 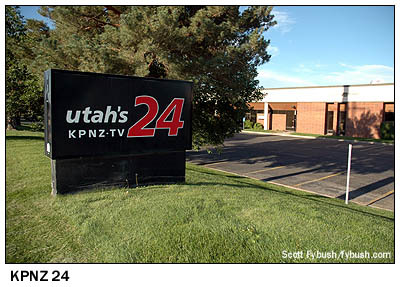 Across the street, KJZZ-TV (Channel 14) draws its calls from the Utah Jazz basketball team, and with good reason - the station is the team's broadcast flagship, and it's owned by team owner Larry Miller. (He also owns sports radio stations KFNZ 1320 and KJQS 1230.) 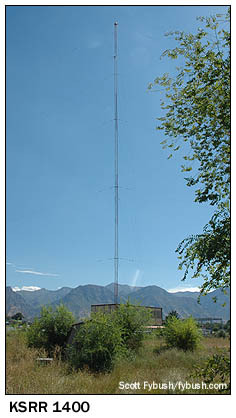 KJZZ is also the MyNetworkTV outlet in the market, but it delays the mini-network's offering until late each night. 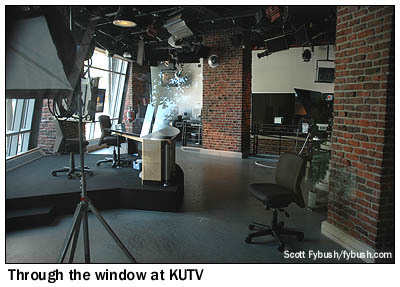 It carries local news, too, produced downtown at KUTV. We complete our little tour of Salt Lake commercial TV studios a few miles to the south, where ABC affiliate KTVX (Channel 4) and CW affiliate KUCW (Channel 30) were owned by Clear Channel Television when we visited in 2007, but are now part of the Newport Television group that took over the group a few months later. 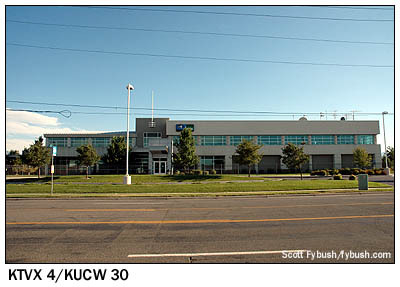 The current studios just north of the I-215/UT 201 junction are the fourth for KTVX, Utah's oldest TV station, which began in 1947 (as KDYL-TV, successor to experimental W6SIX) in the Walker Bank Building downtown. 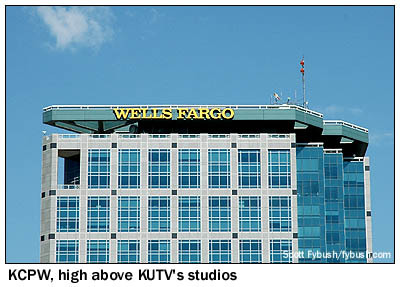 As KTVT (1953) and KCPX-TV (1959), the station later moved to Social Hall Avenue, on the same block as KUTV and KSL-TV. 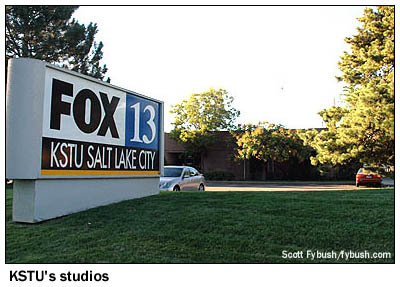 The seventies brought a call change to KTVX and a move to West Valley City; the current studios are just a few years old. Ogden-licensed KUCW became a sister to KTVX in 2006; it also carries some NBC programming that KSL-TV preempts, including "Saturday Night Live." And we wrap up the tour with the lone studio site east of downtown, up at the University of Utah campus in the foothills of the Wasatch Mountains. 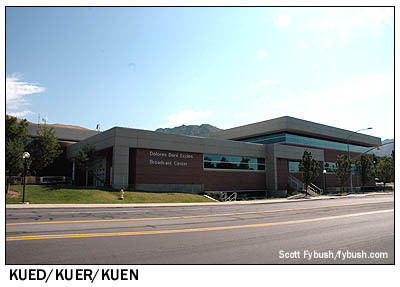 The Dolores Dore Eccles Broadcast Center on campus includes studios for public TV station KUED (Channel 7), public radio station KUER (90.1) and the Utah Education Network, which broadcasts instructional programming statewide on Ogden-licensed KUEN (Channel 9). We're almost done with our Salt Lake tours - there's one more radio studio to take a peek at in next week's edition, and then we'll head for the hills, examining the signals of Park City and of Evanston, Wyoming before turning north towards Montana. And don't forget to join us over at sister site Tophour.com on Wednesday for a whole bunch of IDs from Ogden and Provo!